The full balance of the rental is collected upon booking, including local taxes and fees. 50% is non-refundable. The remaining 50% can be refunded with two weeks written notice. Such a notice must be received as of 11:59pm PST 14 days prior to the group's arrival date. After this 2 week grace period, the entire reservation becomes non-refundable and the reservation may not be modified for any reduction of dates or guests. No-show reservations will be charged the full balance and any applicable and associated fees..
Tour buses and trucks are permitted in our parking lot for pickup and drop off but parking would cost $30 per day. Non-commercial vehicles are welcome to park for $20/night. Parking expires 12noon the next day. Guests between the ages of 12-18 may be considered with a guardian on a case-by-case basis. Please inquire! 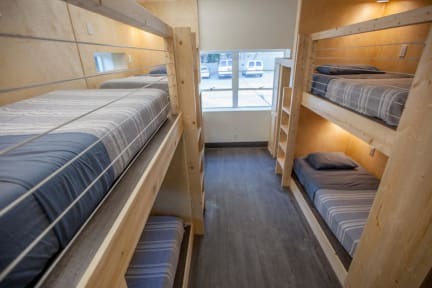 DormShare can offer private rooms to groups when renting all of the beds in that specific room. Each room is made up of 1 to 8 beds in twin or full sizes. A twin only sleeps 1 and a full bed could sleep 2. All bathrooms, common areas, parking lot and kitchen are shared. A larger group could rent our max capacity of 90 beds, but 1 room of up to 6 staff would still be on the premises for security. DormShare contains two floors of rooms in a large three-story building. With lots of windows and space to yourself, our location is a comfortable co-living space for any duration of stay. We have onsite parking, an outdoor patio, large community kitchen and plenty of bathrooms. All common areas are shared. If you'd like a private room, you may rent out every bed in the room. Bathrooms, kitchen, and lounge area are shared. We do have several rooms with private bathrooms. 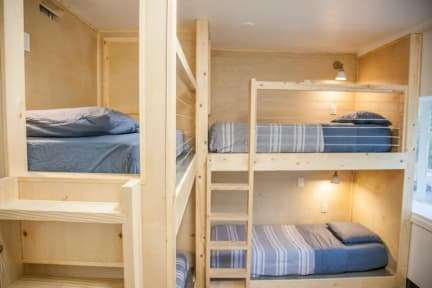 Each room is made up of 1 to 8 beds, custom-built out of birch and pine with personal amenities such as outlets, a night light, and lockers. Rent a twin or full bed in a shared room to save, or pay for all of the beds in the room to make it private. Payment upon arrival by cash, credit cards, debit cards. (Payments with credit or debit card we charge 3% fee). Reception Time 10:00 to 23:00. (In case of late arrival please make sure to inform us via email or phone call). We do not accept customers younger than 18 years of age, we can make exceptions for minors age 13+ if with traveling with a guardian. Attitude...two of the old age sttafes really have bad ignorant attitude. The place just sooooooo hot, can hardly breath in afternoon.